Sport psychology suggests that flow follows focus, and that’s exactly how flow is created in the Parallel Mode Process – by fixing your focus on your contact zone and letting the ball move into an out of this fixed field of focus. So, yes, flow follows focus, but it would be better said that flow follows a fixed-depth of focus because flow does not follow a variable-depth of focus. What a fixed-depth of focus accomplishes is both a mental focus on your contact zone and a visual focus on your contact zone, with your contact zone being defined as the area of space and time in which the most important event in a contact sequence sport takes place – the contact event. Having the contact event “in focus” both visually and mentally seems like an obvious plus if what you’re after is positive contact, so pre-focusing your eyes and your mind on the contact zone is the most logical way to ensure the contact event will be in focus both visually and mentally. But a fixed focus on your contact zone means one thing is certain; it means you are not focusing your eyes or your mind on the ball – the object of contact. That doesn’t sound very logical at all. In fact, de-focusing from the object of contact by pre-focusing on the contact zone sounds totally illogical. Who in their right mind would defocus from the ball when the object of the game is to make contact with the ball? To the rational mind the only logical way to focus your eyes and your mind in a contact sequence sport is to focus on the object of contact. It’s only logical to focus on the ball. That’s what we all grew up with if we played fast-moving ball sport such as tennis or baseball or soccer or volleyball or lacrosse – the list goes on. We were all taught to focus on the ball, to concentrate on the ball. Our visual focus and mental focus were honed in on the object of contact, which was often the object moving way too fast to keep “in focus”. Thus we were all being trained by well-meaning coaches to attempt an impossible visual task, that of keeping a fast-moving object “in focus” as it speeds along its flight-line toward our contact zone. So these well-meaning coaches were, in fact, training us to do the logical thing with our visual and mental focus, only the logical thing they were training us to do was also visually impossible! Unfortunately, that’s still the way conventional visual/mental training is taught. “Keep your eyes on the ball! Concentrate on the ball!” Both sound logical, rational, solid visual and mental advice. And any focus training that steps outside that rational box is considered not only irrational, but also illogical. Fixing your visual and mental focus on your contact zone is about as far outside the conventional box as you can get, so you can imagine the reaction one gets by even suggesting that there is a more efficient and accurate way to use your visual and mental focus than focusing on the ball. To the rational mind, defocusing from the ball by pre-focusing on your contact zone sounds irrational. Let me introduce a different perspective: the one that says fixing your visual and mental focus on your contact zone and letting a fast-moving object come into focus is actually more logical than trying to do the impossible task of keeping a fast-moving object in focus along its flight-line. In other words, it’s not irrational to fix your visual and mental focus on your contact zone it’s actually transrational, meaning a mental and visual focus that is fixed on your contact zone transcends the rational way of using your focus. But here’s the most interesting part. With your eyes and your mind focused on your contact zone, you still “see” the ball coming toward your contact zone. It’s the fast-moving object that is coming into focus as it gets closer to your contact zone. So “seeing” the ball is included in this transrational approach to using your visual and mental focus in fast-moving ball sports. Transcend and include. That’s what you get with this transrational approach to focus in sports. Focusing on your contact zone transcends focusing on the ball, but it includes seeing the ball. In fact, you see the ball much better, much more clearly when you are pre-focused on your contact zone because the ball is always moving into your pre--defined focal field. Not to mention the fact that pre-focusing on your contact zone eliminates that pesky problem of refocusing to your contact zone. That’s the biggest problem with keeping the ball in focus with your eyes: you can’t continuously refocus your eyes from one fixation point to another fast enough to keep the ball in focus. Consequently the ball is often out of focus when it gets to your contact zone. Now that sounds irrational! Which of these two scenarios sounds the most logical? Scenario 1: The object of contact out of focus at the contact zone. Scenario 2: The object of contact clearly in focus at the contact zone. Scenario 1 occurs all the time when you try to keep your visual and mental focus on an object moving too fast for your eyes. Scenario 2 also occurs all the time, but it only occurs when you keep your visual and mental focus on the contact zone and let the fast-moving object come into focus. Here’s something to consider: If you have ever been in the zone, then you will remember how clearly you saw the ball that day. Heightened visual awareness is one of the main characteristics of a flow state as reported by athletes around the world. When you are in the zone you actually see the ball better than when you are playing in your normal performance state, playing in the norm. Why do you think that is? Why do you see the ball so clearly when you are in the zone? What are you doing differently with your visual focus that would heighten your visual awareness of the ball as it moves toward your contact zone? The answer is right before your eyes! You see the ball better when you are in the zone because of a subtle focal shift you unconsciously make from focusing on the ball to focusing on your contact zone. So subtle is this focal shift that it usually goes by unnoticed. What you do notice, however, is a heightened awareness of the ball; you see the ball better than ever, but you also see everything else in your visual field better than ever. What causes that heightened visual awareness? What are you doing differently when you shift into the zone that is causal to this visual phenomenon? Try this on for size: when the zone comes over you for no apparent reason, you are unconsciously shifting your focal pattern from focusing on the ball to focusing on your contact zone. You see the ball better because it is coming into focus as it moves closer to your contact zone. And you see what’s happening in the whole of your visual field better because your focal pattern allows you to take in all of the action in your visual field simultaneously. With a fixed-depth of focus you get a wide and open perspective, rather than the tight and limited perspective you get when you focus on the ball. Here’s an important question for you to consider: If playing in the zone includes the heightened visual awareness caused by fixing your visual and mental focus on your contact zone, then would it not be logical to assume that fixing your visual and mental focus on your contact zone would include playing in the zone? As you can see, there is much more to fixing your visual and mental focus on the open space of your contact zone than first meets the eye. It is the focal pattern you unconsciously shift into when you shift into the zone. It is also possible therefore, to consciously train yourself to shift into this fixed focus visual and mental pattern, and, in so doing, consciously shift into the zone. 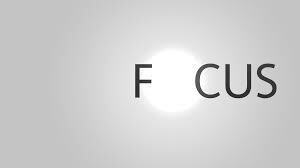 If flow follows focus, as sport psychology suggests, then the question of regard is: how are you using your focus? It might sound irrational, but fixing your focus on your contact zone is actually a transrational approach to visual and mental focus in sports. Yes, fixing your visual and mental focus on your contact zone instead of on the ball is, indeed, outside the rational box of conventional training. But so is the zone!